The MZR engine and its implementation in the Roadster is noteworthy. The engine is an aluminium block and head with iron cylinder liners. The double overhead camshafts are driven by a chain rather than a belt. The engine also features molybdic coated anti-friction pistons, variable valve timing on the intake side, electronic sequential fuel injection, and a coil-on-plug ignition system. Engines in all markets use a compression ratio of 10.8:1 and a stroke of 83.1mm. The bore on the 2.0 is 87.5mm and 83.0mm for the 1.8 litre version. Despite being a larger displacement, the MZR is actually a smaller unit than the previous generation BP engines. It also weighs some 19kg less thanks to it's aluminium construction and lightweight plastic intake manifold and cam cover, even the flywheel is 0.3kg lighter than previously. The engine is tilted 10 degrees to the right to allow room on the intake side for the Variable Intake System (VIS) inlet manifold. The VIS has two operating modes designed to boost torque, it is also tuned to alter the engine sound at high revs. Between 3250 and 5000rpm the VIS valve is closed to maximise torque and produce a nice sound from equal length intake runners. Above 5000rpm to redline the valve opens creating shorter unequal runner lengths and altering the induction noise to become a more throaty rumble. In the UK the inlet manifold has extra swirl-control valves to reduce exhaust emissions at low revs and improve driveability from cold. 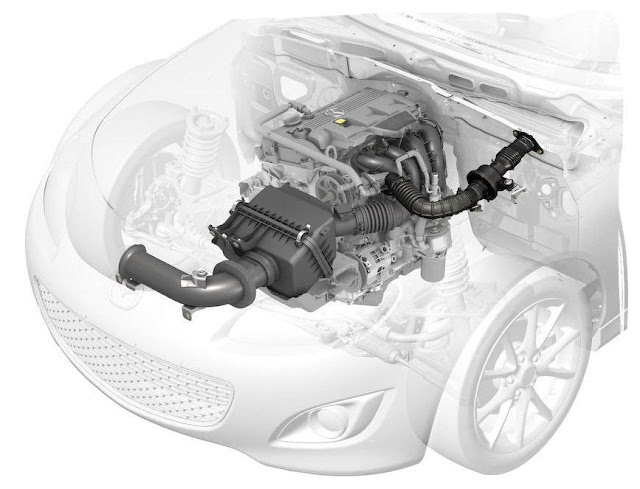 Mazda says inlet restriction has been reduced by 57 percent and exhaust restriction is down by 40 percent. To improve handling dynamics the heaviest items were moved closer to the centre of the car. The engine is mounted 135mm further back than in the previous generation, sitting behind the front wheels. This was partly achieved by using a smaller heater unit and creating more space between the driver and passenger. The battery is now found in the engine bay as opposed to the boot as being upfront moved it closer to the centre of mass. The NC2 Mk3.5 revisions introduced some changes to the 2.0 MZR engine internals on manual transmission cars. These include a new forged steel crankshaft, forged steel connecting rods with floating wrist pins, revised pistons with stronger wrist pin bosses, stiffer valve springs, and an engine oil cooler. These changes didn't noticeably increase power (it went up by 1 Bhp) but did allow the rev limits on manual transmission cars to be raised by 500rpm making the car feel even more lively. Probably the most talked about topic will be power outputs. I've put together a table below which shows how the Roadster's engines compare across the different markets. The figures were taken from Mazda's published technical data. Let's start with the original NC1 model. You can see the only option in Japan and the USA was the 2.0 litre LF-VE MZR. In the UK we seem to have been short changed on the power output of our 2.0 litre engine. In UK tune it produces 160PS (158Bhp), a whole 10PS down from the intended power, this is possibly due to EU emissions regulations and the additional swirl control valves in the intake system. The differences between stated power for each market may also be a result of engines being tested in different ways and to different industry standards (SAE, DIN, JIS). We do get a 1.8 litre engine option which produces 126PS (124Bhp). This is quite a decrease and was probably introduced in European markets to help with insurance and tax costs. Note the 1.8 delivers peak torque and power earlier than the larger engine. The slight differences in power and torque between the Japanese and American engines are most likely due to conversion between the PS and Bhp units. Similarly with the torque figure which is converted from lbft to Nm. Let's move on and take a look at the figures for the NC2 and NC3 models. With the revisions from the original model the newer car needs to be revved more with peak power further up the rev range. Peak power from the 2.0 now comes in at 7000rpm up from 6700rpm, the redlines are also raised by 500rpm with the Japanese models now going to 7500rpm. In the UK the 1.8 litre didn't change and still develops peak torque and power earlier in the rev range than the 2.0 litre. One thing to note is the fairly narrow power band of the MZR engine, you need to keep the revs up between 5000 and 7000 to get the most from this engine.